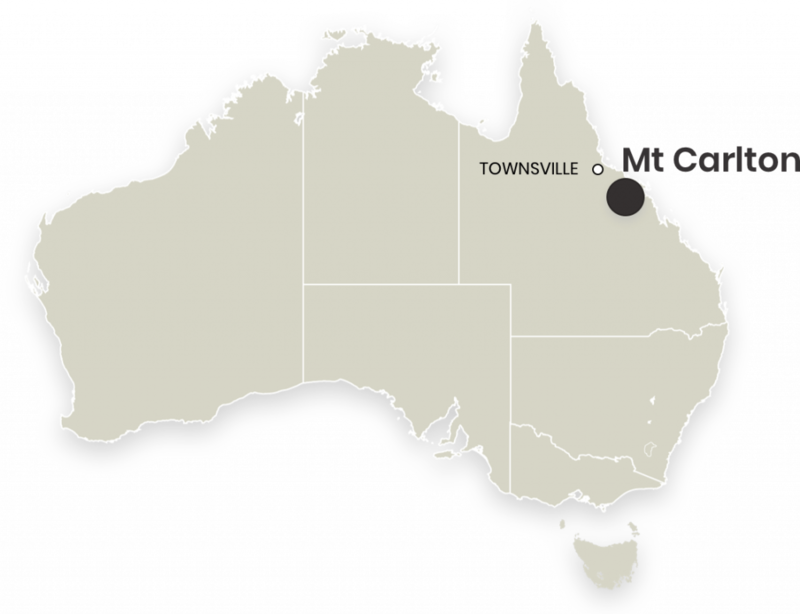 Our Mt Carlton operation is located 150km south of Townsville, Queensland, on the traditional lands of the Birriah People. Our local communities are Gumlu, Home Hill, Bowen and Townsville. At Mt Carlton, Evolution developed the expertise to commercialise a refractory, non-oxidised, high-sulphidation epithermal deposit which is a great credit to our people. The operation was developed by Evolution and commissioned in 2013. It is now a highly successful core asset and is one of the highest-grade open pit gold mines in the world with an innovative team culture driving this impressive performance. The operation has a current mine life out to 2025 and further mine life extensions are likely. Ore is sourced from the V2 gold-copper-silver deposit which is processed on site to produce a concentrate and shipped to China for smelting. The process plant has a current capacity of 840ktpa. Approximately 10 – 15% of gold feed is recovered through a gravity circuit prior to the flotation circuit to produce doré gold bars which are sold to the ABC Refinery in Sydney. The gravity circuit was installed in 2017 and has lifted recoveries from 88% to 90 – 91%. Mt Carlton’s injury reduction in FY18 was impressive with TRIF reducing from 8.2 to 3.9. The operation installed the CAT fatigue management system in the truck fleet to assist in managing fitness for work. Mt Carlton produced more than 100koz of gold for the third year in a row with FY18 production of 112,479oz. This exceeded the top end of the 100,000 – 110,000oz guidance range. A record low AISC of A$535/oz was achieved which was substantially below guidance of A$680 – A$730/oz. Full year net mine cash flow was a record A$108.7 million. Mt. Carlton operation has ISO 14001-2015 Certificate for Mining, Ore Processing Operations, and Support Services for Gold production.